Oregon has topped the list as the most popular place to move to for the second year in a row. Oregon being a desired location for living is contributed several factors. The first likely reason people are moving to Oregon is the outdoor recreational space available for camping, hiking, hunting, and so on. Another big reason is the cost of living is lower in Oregon than the average in America, lower by 1.2 per cent. Also, in 2013 Oregon was one of the top 3 states for job growth, reasonably attracting more people to this state in the great northwest. Read more about what is pulling people to Oregon below. Economist Michael Stoll, chairman of the Department of Public Policy at the University of California, said the figures reflected the overall trend in migration towards southern and western states.However, it is Oregon's 'unique amenities' which he believes push it to the top of the pile. These include outdoor recreation, arts and entertainment activities, and green space - which the mountainous state has plenty of. 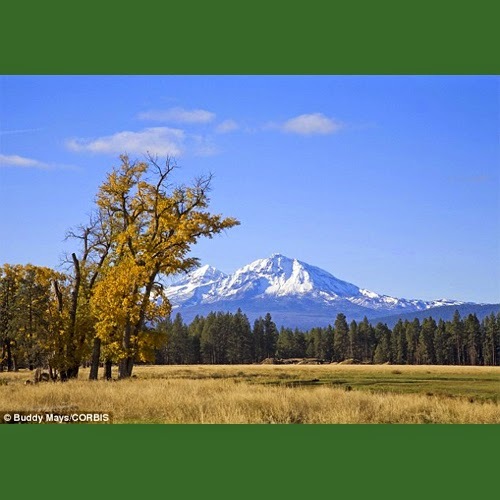 Travel Oregon, the state's tourist board, lists its own 'seven wonders' - including the Columbia River Gorge, to Crater Lake and the Wallowa Mountains.